“Integrated farming is much more interesting than mono cropping. It is nice to have farm with diversity in plants and livestock. It also helps to learn more things endlessly. Monocropping is risky, mundane and bad for soil. In case of some problem either in cultivation or market price, if the mono crop fails then it shall be a complete loss whereas it is never so in integrated farming. If one crop looses then surely other crop picks up. The flow of cash is continuous every month,” insists Mr. Shivappa Hanumappa Hadimani. His farm is located at Kotnalli village, Bagalkot district, Karnataka. Maize is the main crop grown commercially in the farm. 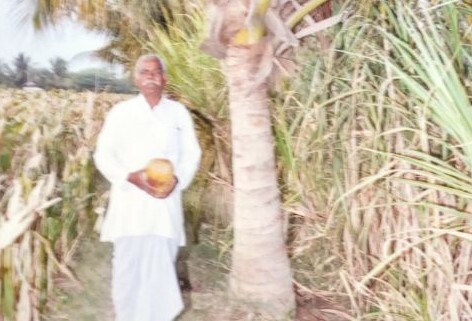 As trees help in improving bio-diversity Mr. Shivappa planted a good mix of tree varieties across the 8 acre farm area. These are 100 coconut, 10 sapota, 10 mango, 100 teak, 10curry leaf and 10 drumstick trees. Seasonal vegetables grown are onion, tomato, brinjal, okra and ridge gourd. “We grow almost all veggies even the green leafy vegetables like fenugreek, coriander etc. Oilseed cultivated is groundnuts. We are cultivating sugarcane in 1acres for the seed purpose. We will harvest seeds in another 6months and then start the cultivation,” he adds. An integrated farm needs to have livestock, “Yes! We have cows, sheep and poultry in our farm. The set is small but largely helpful in farm maintenance and contributes to farm revenues significantly. We have 4 cows of jawari breed and 2 buffaloes. The milk yield is less but for us it is mandatory to have these local breed of Karnataka for its dung and urine. The milk yield is less but quality is superior thus instead of selling it to cooperative we prepare butter and sell it at Rs. 1500/kg. On an average we are able to produce 2 kg butter every week,” states Mr. Shivappa. Commonly 8-10 sheep are always there in the farm and it keeps changing. Sheep kids are sold at Rs. 5-6000/animal and its litter is used for making manure. “We also have local jawari breed poultry birds. We sell eggs if in excess and also hens. Litter of birds is nutrient rich thus it is decomposed to make manure,” he says. Mix of organic and conventional farming is practiced in the farm. “We do use chemicals but our focus is more on using cow based manure along with sheep and poultry litter turned compost. 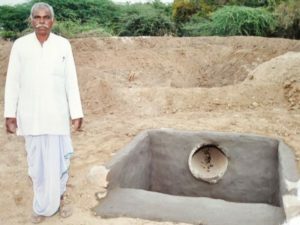 We make all the commonly used agri inputs from cow dung and urine such as panchgavya, jeevaamrit, farm yard manure etc. Slurry from biodigestor is fed to the soil regularly. It helps immensely to restore soil health. IN addition we grow manures once in two years for improving the soil health like sun hemp for 1.5 months,” he shares. Crop cultivation is planned as per the season. Pre monsoon vegetable, wheat, Bengal gram (household purpose) crops are selected while post monsoon in 2 acre groundnuts, 2 acres jowar and maize are cultivated. Later to harvesting these three crops seasonal vegetables are grown. “We grow onion every year in different places so that it helps in crop rotation. In our production plan we also consider the harvesting period. We ensure crops cultivated have different harvest time so that every harvest would have at least 15 days time. It is a cycle as per the nature. It moves on naturally,” he states. Sprinklers and flood irrigation is used in the farm. Price fluctuations in farming must be controlled feel the farmer. He went through difficult time due to a continuous dip in the vegetable prices. “Onion is sold anywhere between Rs. 50 thousand to Rs. 1 lakh per annum while production cost is Rs. 20-30 thousand. Tomatoes and brinjal seems to no-profits at all! Similar was the issue with groundnuts. The yield has dropped and so is the price! Earlier we used to get 20-22bags of 35-40 kg but now it has reduced to 10-12 bags. We have asked for assistance from KVK, hopefully next season shall be profitable,” he informs. 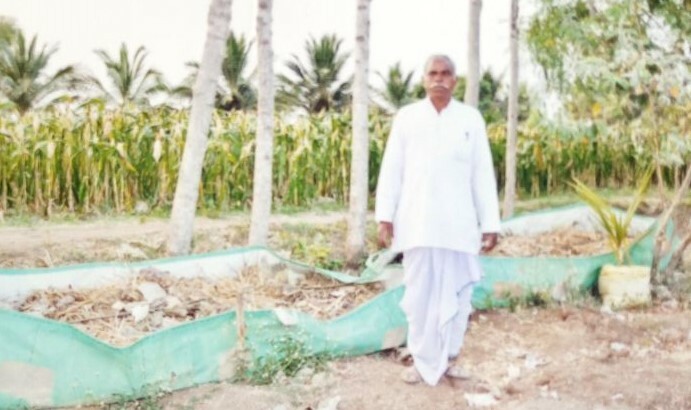 Inspite of the recent loss in vegetables farmer keeps up his spirit with livestock rearing and fruit trees. “This is the reason why integrated farming is important. It strikes the balance. Loss doesn’t deter me from agriculture. Also as I belong to a farmer’s family I felt farming is suitable for me than any other profession. It is been 20 years I am into farming and deeply satisfied. I find farming to be profitable. Further we follow simple process then there are not much problems faced. In my farm I find new technique driven farming difficult so I have age-old farming practices and it is worth it all. I enjoy farming and that is more important,” he concludes.